Without question, the very finest Matcha in the world. Normally Matcha, the non-organic variety which is the principle widely sold version of "Matcha", is harvested over a 3 to 4 month period. As such, you have various harvesting times;; early, mid and late. The retailers have chosen to ascribe names such as "Imperial Grade" or "Ceremonial Grade" to the tea harvested more early. It is just a play on words, for all Matcha is truly "Ceremonial". But yes, in the "Non-Organic" realm, you have several harvests; the earlier the better. Organic Matcha is an entirely different breed of tea. Harvested over a short window of 6-7 weeks, there is technically no "early" harvest, as we have said in our prior writing. They take this marvelous tea, and average it or blend it, and you have your organic. With all of this said, there is something one step higher, that is generally not available in the U.S. You have to love the Japanese, they tend to "cherry pick" the very best (eg: 1st week of harvest) and set it aside for the elite, at prices 2 to 3 times the normal going price for the organic. 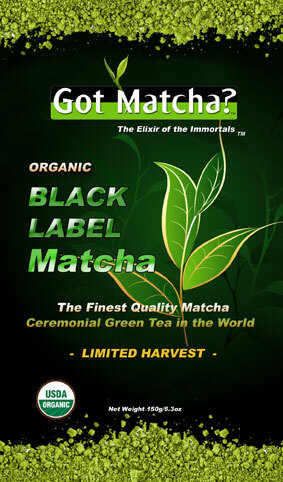 Got Matcha recently had the opportunity to purchase some of this emerald green tea, truly the finest we have ever seen. We have the option of buying this on a very limited level, if we choose to do so moving forward. It will depend upon the interest of our members.. This tea is available ONLY to members, and nowhere near the 200 to 300% surcharge the Japanese charge overseas. If you're adventurous, and want to try the finest Matcha in the world, then we highly recommend it. 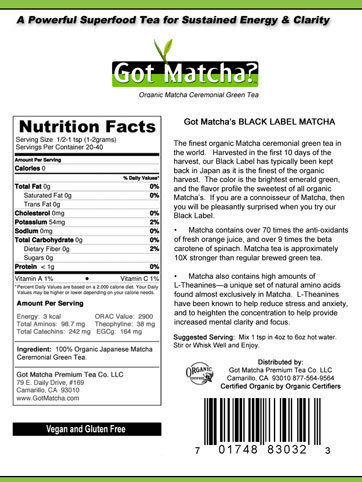 Black label matcha benefits are no different than our Organic, but you will notice the color and taste profiles slightly different. Truly the smoothest Matcha green tea latte you will ever try! A matcha green tea latte brings mental concentration, emotional stability, composure of mind, and physical well being. Available in 40gram, 80gram and ½ pound sizes.